Sun exposure, aggressive exfoliation treatment, and sometimes genetics can cause tiny blood vessels to appear as red patches and blotches on the face. IPL skin treatments at our clinic in Box Hill can greatly reduce their appearance and even eliminate these vascular blotches altogether. This is designed to target the haemoglobin in the capillaries. The dilated blood vessel absorbs the light and the heat that is generated constricts them to reduce redness and flushing on the face. This also improves the general overall appearance of the face. Spider veins and other vascular lesions commonly known as broken capillaries are another sign of photo-aged skin. As the skin ages, it becomes thinner and less “elastic”. In this case, the light from the IPL vascular treatment targets the haemoglobin in the capillaries. The dilated blood vessel absorbs the light and the heat that is generated at the site constricts them so they are no longer viable. They become naturally absorbed and removed by the body’s lymphatic system. Redness and flushing becomes visibly reduced. As an added bonus, the overall appearance of the skin is improved as the thermal nature of the IPL laser treatment for broken capillaries also stimulates fibroblasts. This in turn stimulate the body’s own response of collagen production, therefore improving wrinkles as well. The number of sessions required depends on the individual, ranging from 1-6 sessions. For best results, it is advised to have repeat treatments at 7–10 day intervals so the vein does not re-establish itself. 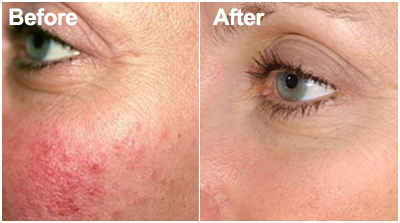 Do you want to remove any undesirable lesions that stands out on your skin? Contact Lose It With Laser today on 0432 162 862 today to book an appointment for our IPL treatment for vascular lesions.